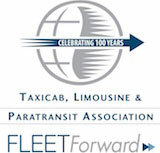 The Taxicab, Limousine & Paratransit Association (TLPA) is gearing up for its major centennial celebration at its 100th Annual Convention & Trade Show in Las Vegas. TLPA staff and board members are hard at work bringing new ideas, new voices, and even a new format to this landmark gathering of the world’s for-hire transportation fleet executives and industry vendors. The event will take place at Caesars Palace from October 27 to 29. Based on feedback from members, this year’s convention will last three days with a jam packed schedule that ensures there is something happening for everyone at every minute of the event. Attendees are encouraged to book their rooms early to take advantage of TLPA’s room block. For reservation and other important information, visit www.TLPA.org/Annual-Convention. Sponsorships and booth spaces are also going quickly. Industry vendors who want to take part in this historic moment are encouraged to secure a spot by calling TLPA without delay at (301) 984-5700, or emailing Meetings Manager Deb Lagasse at dlagasse@tlpa.org. A specially convened working group is already reaching out to high profile speakers to join the expected 1,000 fleet executives and top industry vendors at the event. The annual Taxicab, Limousine & Paratransit Foundation Golf Tournament, which is always a crowd pleaser and sponsored by Atlas Financial Holdings, will be held this year at a course just off of the famous Las Vegas Strip. Playing a round of golf with old friends and meeting new industry contacts couldn’t be any easier—or more fun! The preparations for the October convention come on the heels of TLPA’s successful Spring Conference & Expo in Oklahoma City in April. It set the stage for the centennial event’s invigorating new content, format and entertainment. An amazing BBQ and company tour. The 3 Taxi Guys, Rick Hewatt, Jamie Campolongo and John Lazar, with the able assistance of Brock Rosayn, provided TLPA members attending the conference with a remarkably generous and delicious meal. Rick Hewatt and Jamie Campolongo, two of the three members of 3 Taxi Guys BBQ Sauce, prepare a BBQ dinner for TLPA members. 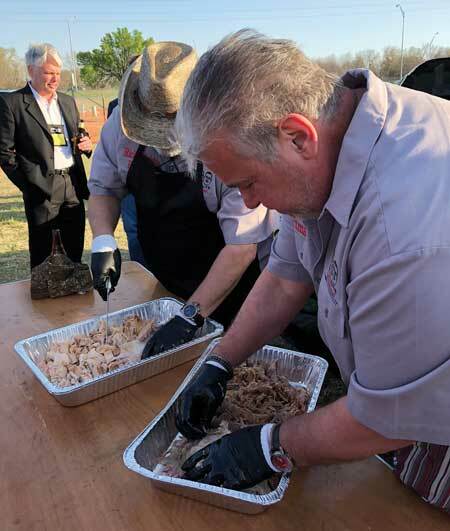 Serving a whole hog cooked in their famous “cabeque”—a taxicab converted into a BBQ smoker—they treated members to a night of real fun, not to mention the sauce, and pulled pork were incredible! TLPA members meet during the 2018 Spring Conference & Expo held in Oklahoma City, OK. The event was held in conjunction with a tour of Airport Express/MedRide which offers shared-ride airport transfers, charter bus service, accessible transportation, paratransit services and a luxury town car service. Industry and educational programs focused on moving fleets forward. Although the industry has weathered challenges over the past few years, the message members sent was clear: We’re moving forward. Members were overwhelmingly encouraged by the update on the development of TLPA’s strategic plan which includes new visions for the future of the association and the industry. The Expo continues to shine. As always, the Expo was the major hub of activity during the Spring Conference. Fleet executives had the chance to see the technology and companies that are helping the industry stay on the cutting edge and achieve operational efficiencies. This conference’s expo featured an impressive slate of vendors who are dedicated to helping TLPA members find solutions to fit their businesses, including the event’s generous sponsors: Azpired and MTI Dispatch (Gold Sponsors); The Black Car Fund (Silver Sponsor); and Flywheel, the 3 Taxi Guys and Airport Express/MedRide (Bronze Sponsors). Ride LocalTM is picking up steam. Attendees were shown how TLPA’s national marketing campaign, Ride Local, can now be personalized for use by fleets in their home markets. Ride Local echoes the “Eat Local” and “Shop Local” movements seen around the country. It encourages communities to support local transportation companies, who in turn support their communities. From posters to vehicles decals to tote bags and more, Ride Local has dozens of products that can help fleets showcase their hometown pride and service. Visit www.tlpa.org/Ride-Local to learn more. Panelists Ira Goldstein, Berj Haroutunian and Matt Daus present during the 2018 Spring Conference & Expo in Oklahoma City, OK.